Geobiologist Hope Jahren has spent her life studying trees, flowers, seeds, and soil. Lab Girl is her revelatory treatise on plant life—but it is also a celebration of the lifelong curiosity, humility, and passion that drive every scientist. In these pages, Hope takes us back to her Minnesota childhood, where she spent hours in unfettered play in her father’s college laboratory. She tells us how she found a sanctuary in science, learning to perform lab work “with both the heart and the hands.” She introduces us to Bill, her brilliant, eccentric lab manager. And she extends the mantle of scientist to each one of her readers, inviting us to join her in observing and protecting our environment. Warm, luminous, compulsively readable, Lab Girl vividly demonstrates the mountains that we can move when love and work come together. 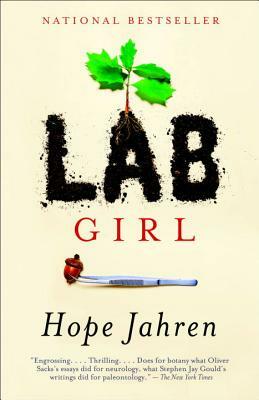 Hope Jahren is an award-winning scientist who has been pursuing independent research in paleobiology since 1996, when she completed her PhD at University of California Berkeley and began teaching and researching first at the Georgia Institute of Technology and then at Johns Hopkins University. She is the recipient of three Fulbright Awards and is one of four scientists, and the only woman, to have been awarded both of the Young Investigator Medals given within the Earth Sciences. She was a tenured professor at the University of Hawaii in Honolulu from 2008 to 2016, where she built the Isotope Geobiology Laboratories, with support from the National Science Foundation, the Department of Energy and the National Institutes of Health. She currently holds the J. Tuzo Wilson professorship at the University of Oslo, Norway.